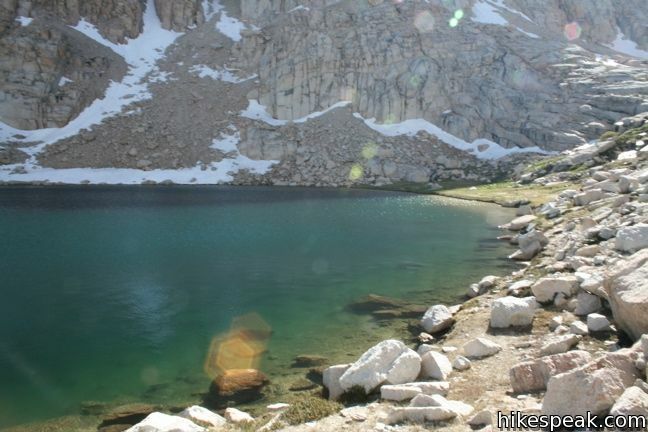 If you are hiking to Sky Blue Lake in the high mountain backcountry of Sequoia National Park, There are nearby lakes worth visiting. 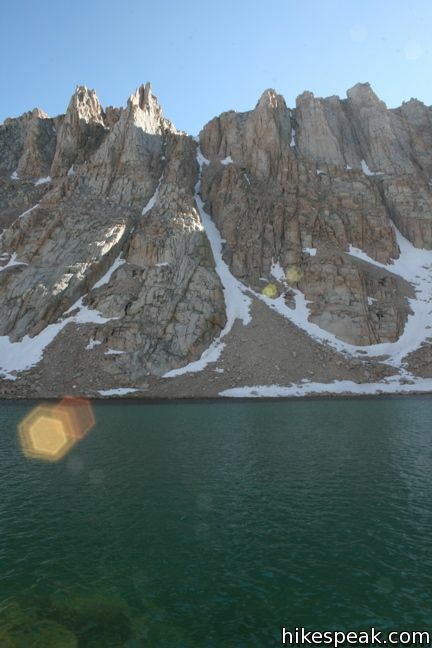 Primrose Lake, is located just off the side of Miter Basin and is a scenic destination. 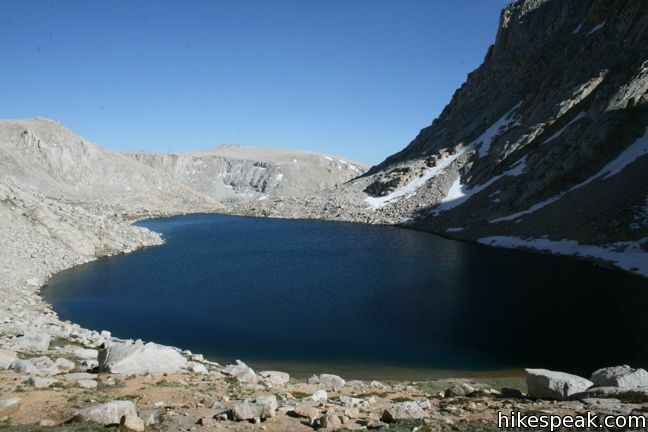 To get to Primrose Lake, follow Upper Rock Creek to Miter Basin. Pass the Major General on the right and turn left up the last cirque before the ridge that separates Primrose Lake from Sky Blue Lake at the top of the basin (see the map below for a visual explanation). 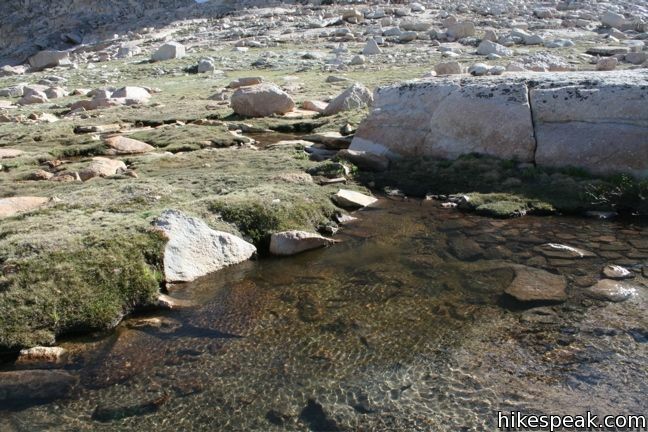 Hike up the rocky slope alongside the drainage coming down from Primrose Lake. Foot-long Golden Trout can be spotted flashing their vibrant red scales in the creek. This area is said to have some of the best fishing in the region, and even passersby can appreciate the beauty of California’s state fish. Mount Pickering peaks up over the rocks beyond the lake, crating an alpine backdrop. Getting to the summit this way requires some serious climbing, so it is better to tackle Pickering via the northeast approach from Sky Blue Lake. 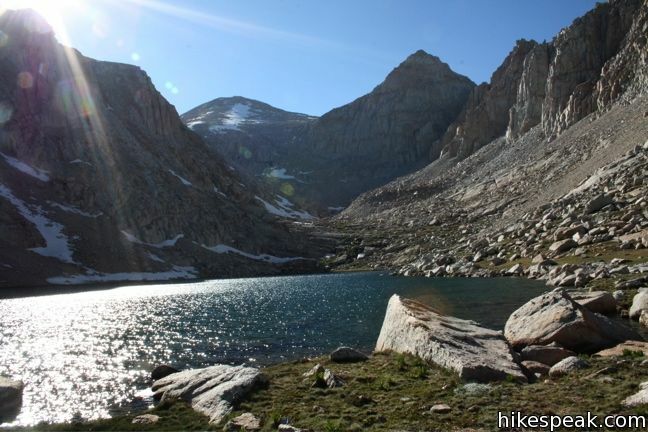 The hike to beautiful Primrose Lake is worthwhile without the summit, adding a couple of miles to a hike in Miter Basin. If you have the time and the energy, the lake’s secluded splendor will not disappoint. 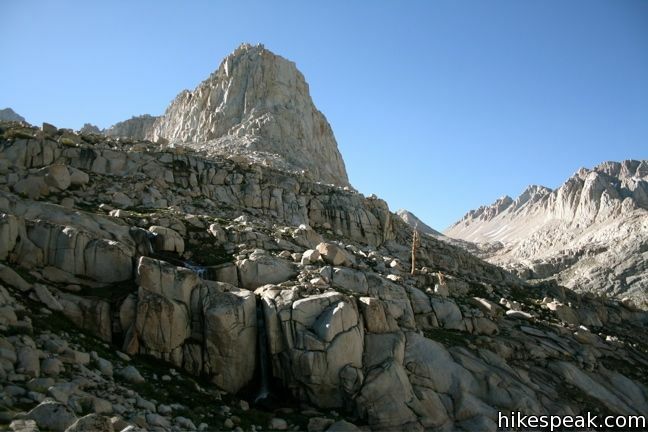 What to know before you go: Permits in the Sierra are stipulated by your point of entry. 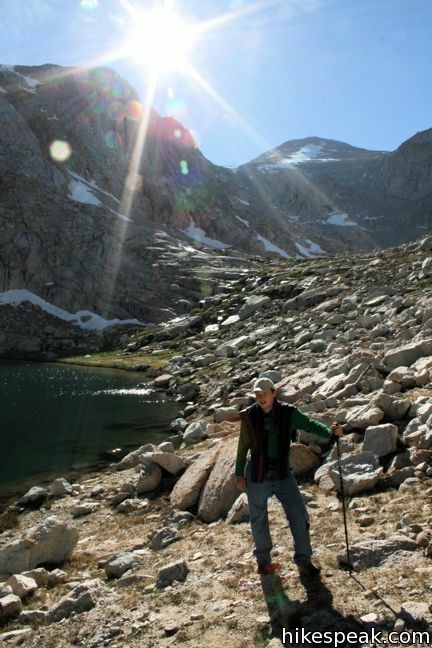 A trail quota is in force at the Horseshoe Meadow trailhead from the end of June to Mid-September. 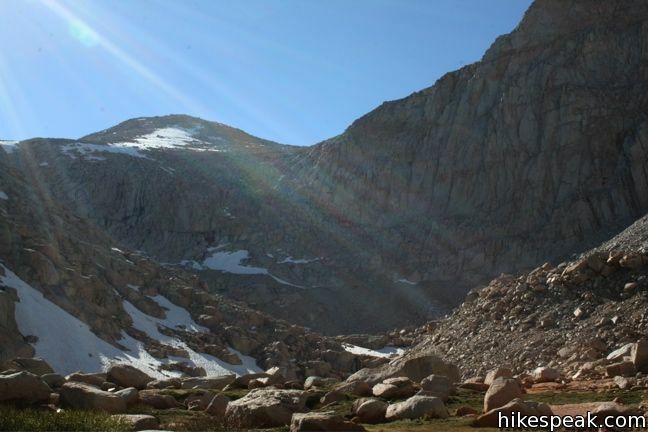 A permit may be booked in advance for a five-dollar fee or picked up the day of the hike at the ranger station in Lone Pine. To be safe, backpackers must carry a bear canister, which can be rented at the ranger station for five dollars. 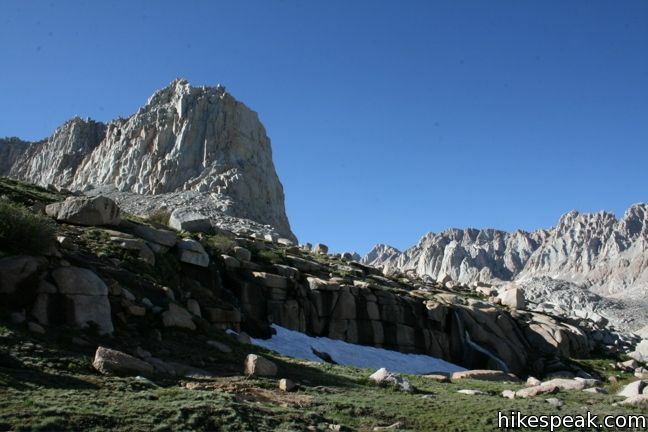 To get to the trailhead: From the city of Lone Pine on Route 395, turn west at the traffic light on Whitney Portal Road. After three miles, turn left on Horseshoe Meadow Road. Drive twenty miles up mountain switchbacks to road’s end at Horseshoe Meadow. Cottonwood Pass trailhead is at the east end of the campground. Cottonwood Lakes trailhead is at the end of the paved road to the right. Take either trail to Rock Creek at Lower Soldier Lake. 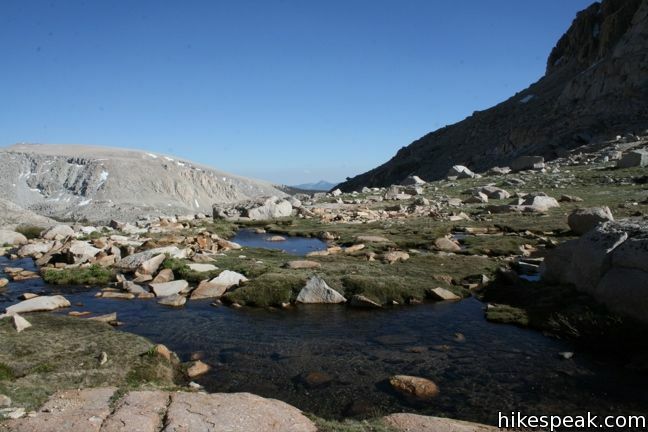 Then trek up Miter Basin, following the directions to Sky Blue Lake. These photos were taken in July of 2009. Click to enlarge. 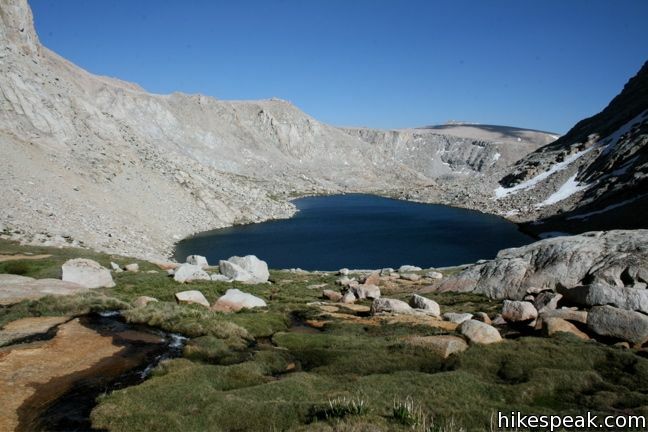 This hike extends beyond Lower Soldier Lake up Miter Basin to a deep blue lake surrounded by towering peaks. 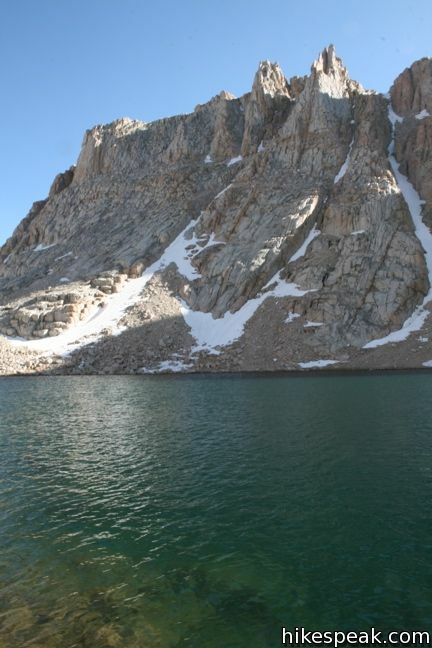 This 13,485-foot summit rises above Sky Blue Lake to offer sweeping views of the Sierra. 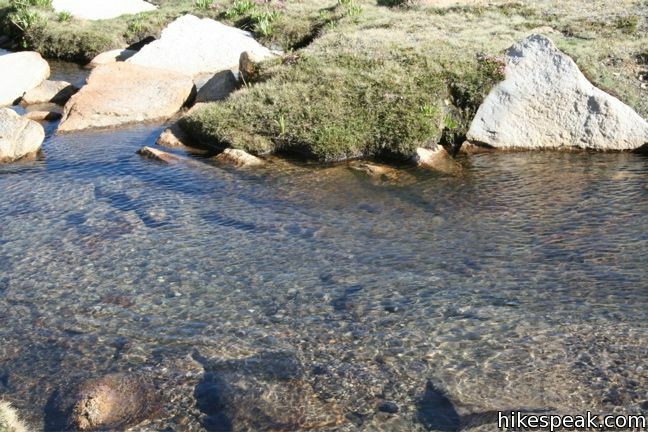 This 7-mile round trip trail ascends 1,200 feet to an 11,200-foot pass and a junction with the Pacific Crest Trail, with access to Golden Trout Wilderness and Sequoia National Park. 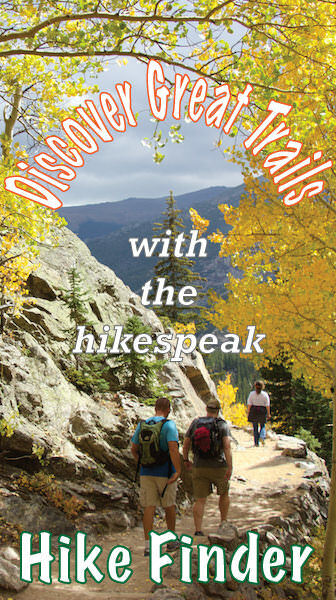 This 8 to 9-mile day hike follows a secluded trail through mountain meadows to the South Fork Lakes and Cirque Lake. 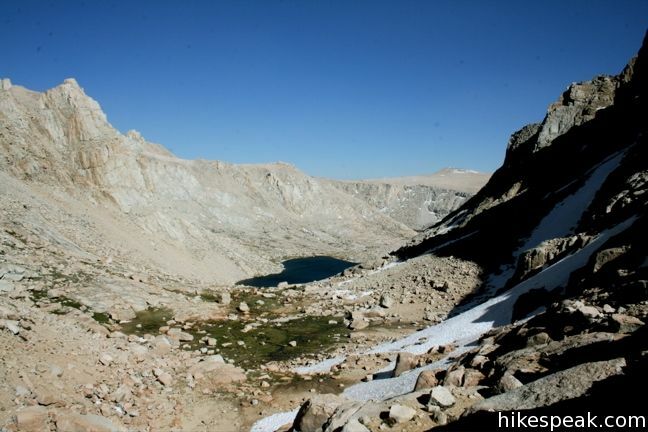 This 22-mile trek travels past Cottonwood Lakes Trail over New Army Pass to a 14,042-foot summit with towering views of the Sierra. 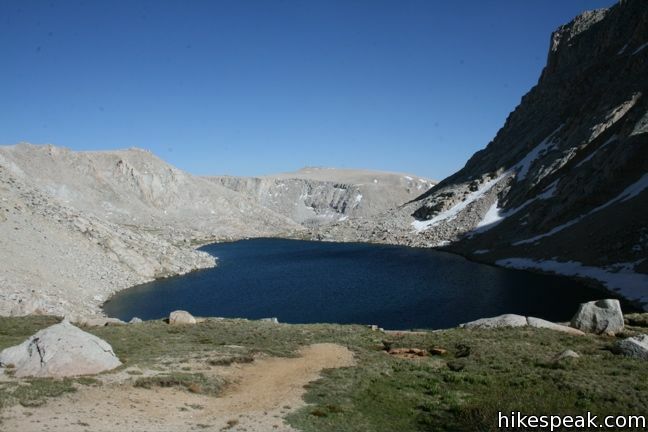 This pair of campgrounds offer 40 sites and serve as a great base for the Cottonwood Pass and Cottonwood Lakes trails.